Thanks to Romulan108 for the Spider-Man pic. 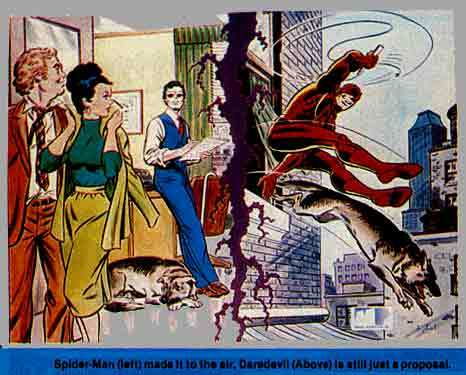 Also, thanks to Spider-Friends.com for many of the DD pics. 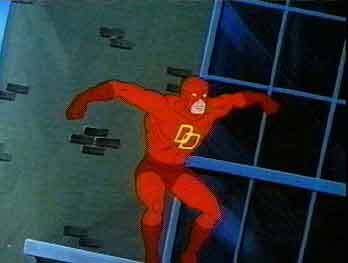 While a Daredevil cartoon has been rumoured to be in development for the past few years, let's look at some places DD has made an appearance. In the 80's, there were plans to make a DD cartoon. DD would be helped out by his trusty sidekick, Lightning the Super-Dog! These scans came from "Comics Feature" #33, 1985. Thanks to Brian Stewart for letting me know of DD's appearance here. Also thanks to Alan Wright for the scans. DD appeared in Season Two, in an episode called 'And a Blind Man Shall Lead Them'. DD helps the powerless FF defeat Doctor Doom who has taken over the Baxter Building. Spider-Man has been framed for committing crimes and Matt Murdock becomes his lawyer. 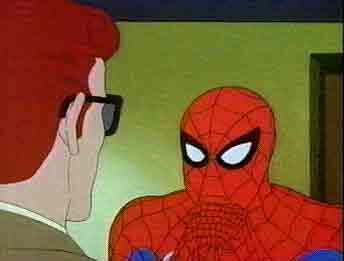 Spider-man explains to him that he can't reveal his secret identity...and Murdock tells him he understands. 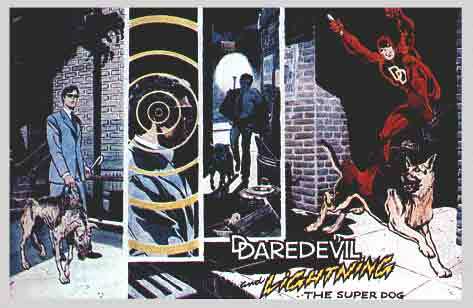 At that moment it flashes to a scene explaining that Murdock is in fact Daredevil, a crimefighter himself. 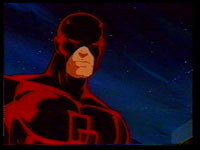 The scene showing Daredevil, as he swings from a flag pole, lasts all of about 2.5 secs. 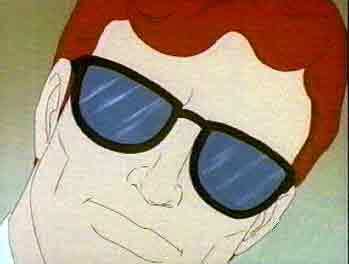 Daredevil's voice is by Edward Laurence Albert. Wilson Fisk helps out Peter Parker, but then Peter is set up for a crime and we find out Fisk is the Kingpin. 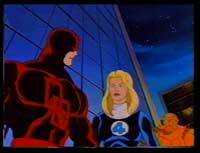 Daredevil guest-stars. Episode 7 - "The Man Without Fear"
Spider-Man and Daredevil team-up to clear Peter Parker's name, and they learn Fisk is the Kingpin. And they also find out who is really behind all the crimes. These episodes are available on VHS as part of the Spider-Man: Sins of the Father tape, and on DVD as part of the Daredevil vs. Spider-Man collection. This DVD was released around the time the Daredevil movie came out in February 2003. It contains the Sins of the Father episodes, the Fantastic Four episode, and a 1966 Spider-Man Kingpin episode. It also has a special Stan Lee's Soapbox. Created at Powerhouse Animation Studios, this Flash animation parody of the Kevin Smith movie "Clerks" features DD, Captain America, Silver Surfer and Galactus!